With accumulated industry experience and technical expertise, Availink has developed System-on-a-Chip (SoC) to enrich the multimedia experience. Armed with a full range of demodulation and decoding chipsets, Availink is able to provide diversified solutions, which blend DVB + OTT + PVR + multi-screen interactions. Availink has released an advanced high-definition video decoding SoC platform for satellite, cable, terrestrial and IP-STB compatibility. It supports decoding formats of MPEG-2/MPEG-4, H.264 and AVS as well as major audio formats. Video post-processing includes de-interlacing, de-blocking, and de-ringing. 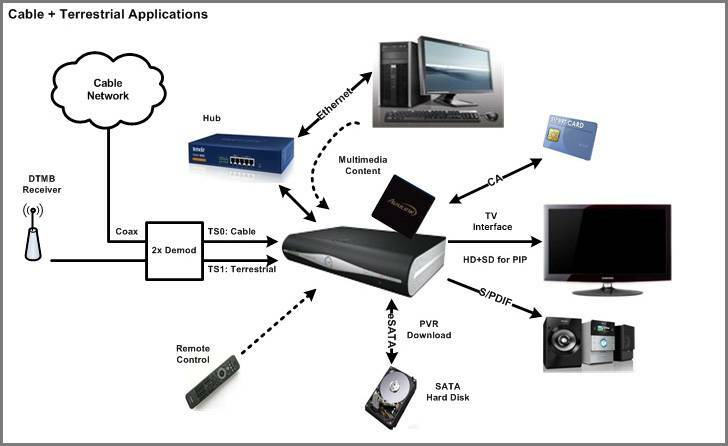 It supports a number of peripheral interfaces such as USB 2.0, SATA, 10/100 Ethernet, SD cards, smart cards and HDMI.